Okay, so here's the deal. I made a big batch of cupcakes, and the kids and I started playing with them. We decorated them with all kinds of designs. The icing was piled high (it looked bad but I heard it tasted wonderful) and the kids got to try their hand at piping the icing out of the bag. That's the night the "Mike Wasowski" and "Jack Skellington" cupcakes were created. 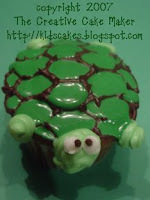 I was playing around with some leftover icing (there wasn't much) and a blank cupcake and made this turtle. He wasn't too difficult to make, but I don't think I'd like to make a lot of them at once. It would be WAY too time consuming. First, I piped the chocolate design on his back. Then I filled in the spaces with dark green piping gel (it can get a bit runny so be careful). Next, I piped on a head, tail and four legs around th eedge of the cupcake. Be sure the icing you use is stiff. The icing we had was store-bought and kept wanting to slide down. Finally, I piped the whites for the turtles eyes and dabbed chocolate dots on them. He's a bit messy, but kinda cute, too. The kids wanted to eat him before I could take a picture.